Time both flies and stands still when you have a newborn. 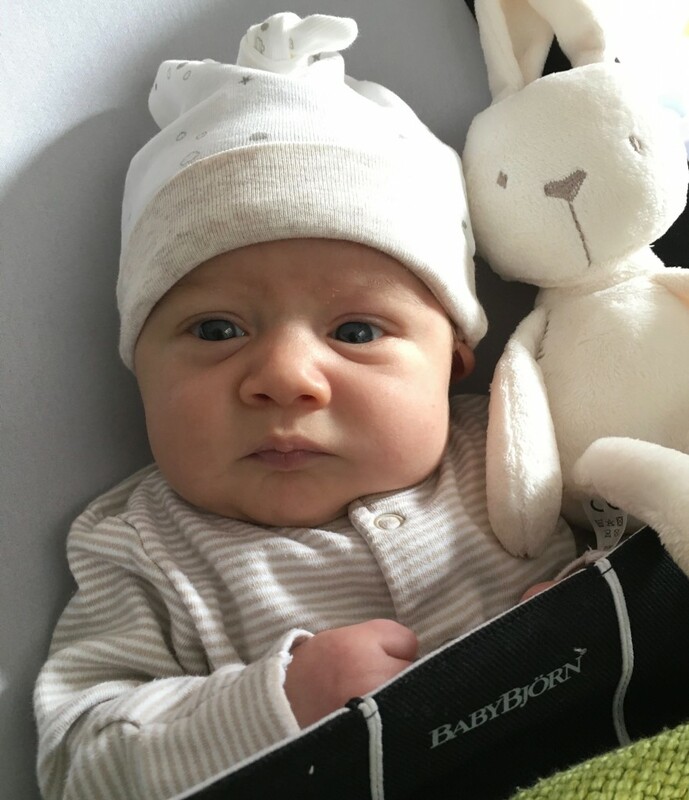 It’s hard to believe that we’ve been home from hospital for over a month, that Nino will be six weeks old on Friday and while I feel like we’re really beginning to get to know this little personality, at the same time he changes on a daily basis. Life is sweet, if more than a little sleep deprived, and I know I’ll look back on these weeks in the months to come and wonder where they went. People talk about the lack of sleep for parents of a newborn baby, but for the babe himself there are hours of blissful slumber. We’re far from into an established routine, but Nino is starting to show some signs of a pattern – after a fitful night he’ll wake for an alert morning period where we talk and play. This is when he’s his most gorgeous – big blue eyes, attempts at smiles and general wonder at the world. Then after a feed I’ll pop him in his sling where he falls into the deepest sleep and I can go about whatever business – tidying the house, unloading the (endless rounds of) laundry or dishwasher, prepping supper, or if I’m lucky, writing and shooting a blog post or baking a cake, . Housewifely chores if ever there were any, but so much more fun (if a little more time-consuming) with a mini human attached to your tummy. I made this rhubarb crumble tart on the weekend with Nino strapped up in the sling, oblivious to the whir of our Kitchen Aid and the odd buttery crumb which got dropped on his head. 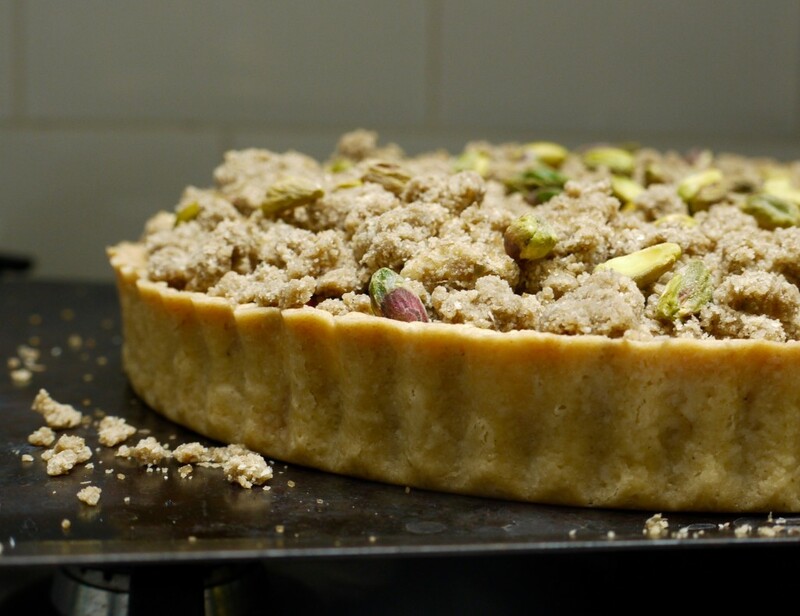 I used this recipe from the BBC Good Food website, subbing in my favourite pastry from Homemade Memories, swapping out the regular flour for rye and sprinkling some pistachios on top. 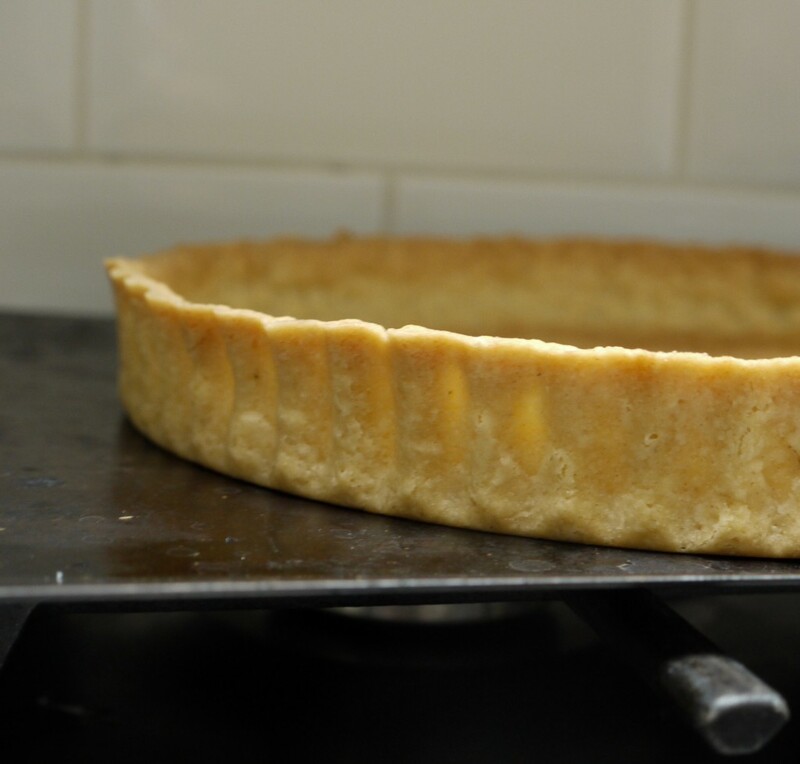 I’m not repeating those adaptations here as I think it could be improved on with a few further tweaks – watch this space for a little loaf rhubarb rye crumble tart version 2.0 in the near future, newborn babe allowing. I am, however, posting the recipe for the ginger and cardamom ice cream I made to serve alongside – no pictures I’m afraid (we wolfed it down too quickly), but the flavour was pretty much perfect. Cardamom pods and vanilla are steeped in a not-too-sweet custard base which I then swirled through with chopped candied ginger and a few spoonfuls of its syrup. Cardamom and ginger work wonders with rhubarb and this ice cream would be just as delicious served with a dollop of it stewed as well as a regular crumble. I don’t have a finished photo of the tart either – on Sunday both our families got together for a roast at my parents’ and it was cut too messily and eaten far too quickly to even think about bringing out a camera – but I do have this photo of our littlest loaf. Every bit as edible and delicious, in my opinion anyway. A rich, creamy ice cream infused with cardamom and studded with chewy chunks of candied ginger. In a medium saucepan, gently bring the milk, cream, cardamom and vanilla to a simmer. Turn off the heat, cover, and leave to steep for one hour. In a medium bowl, whisk together the egg yolks and sugar. Place a second bowl in an ice bath in the sink. After an hour, bring the milk mixture back to a simmer. Strain through a fine mesh sieve into the egg and sugar mixture, whisking continuously until combined. Return the sieved mixture to a clean saucepan and cook gently, stirring continuously, until thick enough to coat the back of your spatula. Strain the custard into the prepared bowl in your ice bath, whisk in the ginger syrup (but not pieces) and leave to cool completely before churning in an ice cream machine according to the manufacturer's instructions. During the last minute of churning, add the chopped ginger then transfer the churned ice cream to a container and freeze until ready to eat. Remove ice cream from the freezer to soften for 15 minutes before serving. Will keep in the freezer for up to 2 weeks. Your little one is so precious! 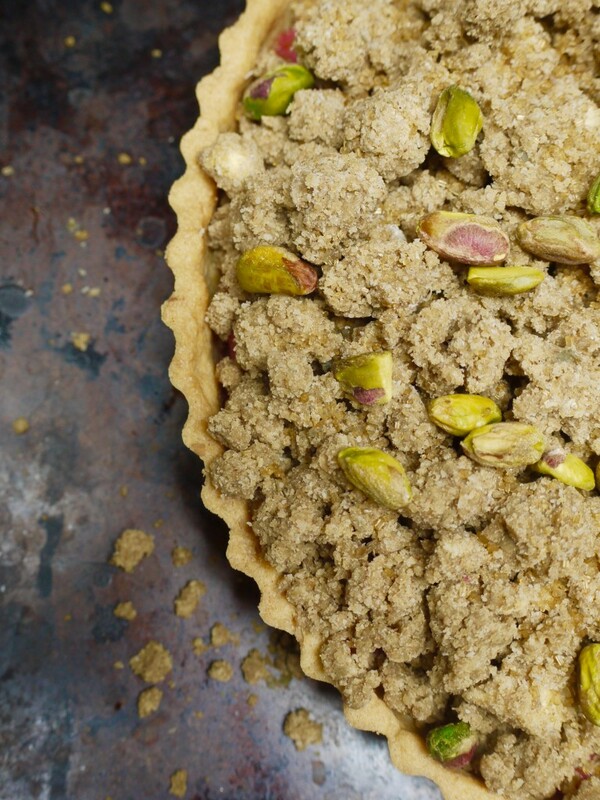 And this crumble sounds so perfect for spring, I love cardamom as well so I can’t wait to try out the ice cream. Happy start of spring! 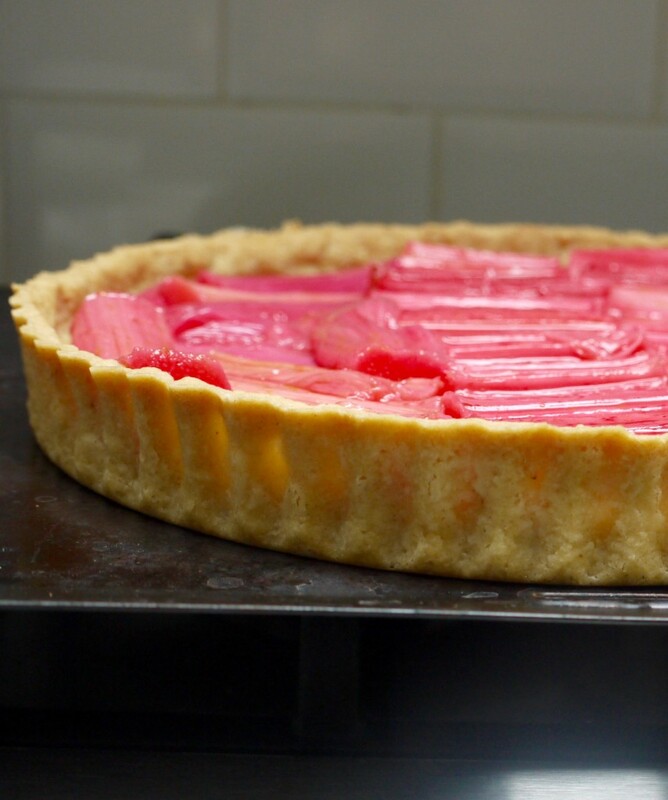 I love the sound of the cardamon and ginger ice-cream i’m definitely going to try it and as a lover and grower of rhubarb I look forward to reading your final version of the tart. The ice-cream will be fantastic if your previous recipes for those are anything at all to go by. I must say, though that more than that I admire the lack of a recipe for the tart. 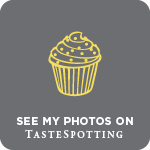 There is nothing better than a blogger who won’t churn out imperfection just to get a post up. I for one would rather wait for your ideal version. Also, seeing things seemingly going swimmingly for you and your little one (plus your big one too!) is really quite heartwarming. And mine tends to fridge-cold!